If you are wondering what causes a dark ring around your neck, it may be the result of simple hyperpigmentation and nothing to worry about. 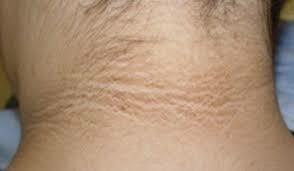 The one cause that can concern people is if it is acanthosis nigricans. This causes dark areas to any skin creases. The skin may appear thicker, and is usually due to higher levels of insulin. This article will help you understand the different reasons this may happen, what you can do about it, and when you should be concerned. This skin condition causes a dark ring and discolored creases around neck or in other areas of the body. It is often seen around the neck, groin area, and even armpits or thigh creases. It can happen to people with diabetes, Addison's disease, or abdominal cancers. Polycystic Ovarian Syndrome, an endocrine disorder, can cause skin color changes and darkening of the skin folds in body creases like, the neck. It is a hormonal imbalance that causes cysts on the ovaries, issues with blood sugar, excess hair on the body, and lack of ovulation. Women who have this disorder may be unable to conceive and are at risk for health complications later in life. Eczema can cause skin color changes due to the rash type nature of this skin condition. It may cause a dark ring around neck and darkened skin folds all over the body. The rash can be itchy and scratching at it can make it worse. Eczema is often caused by allergies to certain things, but it can be inherited genetically. Babies, children, and adults are all susceptible to eczema. It is highly treatable and may even clear up completely if the underlying cause is removed. Liver disease can cause spots on the skin, especially dark areas or spots on the neck, abdomen, chest, and other areas. The liver filters out toxins in your blood and helps to make some substances your body needs. Liver disease consists of cirrhosis, hepatitis, and fatty liver disease. Liver disease can be caused by excess alcohol intake, drug use, or genetically inherited diseases. Fungal infections are caused by an overgrowth of a yeast known as Candida. They can occur anywhere on the skin or the mucous membranes. Candida likes to grow in warm, moist, and dark areas. This means you may find them in the creases of your body, even the folds of the neck area. Sunburn on the neck may cause some of the skin to look darker than other areas. This can occur in the ring of skin on the neck that is exposed to the light, while unexposed areas may remain lighter in color. The ring may continue to appear darker as the sunburn fades to a tan. If you are overweight, the skin fold of your neck may rub together. The friction from skin to skin contact and moisture may cause irritation that results in a dark ring around neck. This may be evident in other areas of the body like under breasts, in between the thighs, and the belly folds. If the cause is a fungal infection, an over-the-counter antifungal cream will help clear things up. Also try lowering your sugar intake in your diet, which can provide food for yeast growth. Keep any creases and skin folds clean and dry. Warm moist areas can provide an environment that fuels the growth of candida or yeast infections. Wash with a good soap and make sure you dry thoroughly after bathing. If you have a tendency to sunburn, use a good sunscreen on your neck, as well as the rest of your body. Use at least a 15 to 30 SPF sunscreen. Research shows the higher numbers may not offer any stronger protection than these numbers. If the dark ring around neck is caused by friction, take steps to reduce this from happening. Walking and exercising along with a healthy reduced calorie diet can help firm and tone those areas. You can also try a dab of medicated powder in the neck folds to reduce the friction. Also, try to avoid tight clothing like turtlenecks. If you believe the cause of your dark areas on your neck is due to another health condition, see your doctor. If you have accompanying symptoms of liver disease, polycystic ovarian syndrome, or uncontrolled diabetes you may need treatment to bring those conditions under control. Liver disease can be life threatening if it progresses to liver failure, while diabetes and PCOS can lead to serious health complications. Your doctor is the only qualified professional to diagnose and treat chronic health conditions stated above and home remedies may not completely take care of the problem.